Quality of workmanship is of paramount importance when supplying fire retardant curtains for businesses. These curtains must meet strict regulations if they are to function as required and this requires a skilled hand and a dedicated to quality. At Corona Contracts the design, manufacture and installation of all of our products is handled by our in-house teams. By handling the entire process of supplying fireproof curtains in-house, we eliminate any margin for error in manufacturing and ensure the end product performs exactly as intended, matching the specification provided by our clients and meeting the highest possible standards of quality and performance. 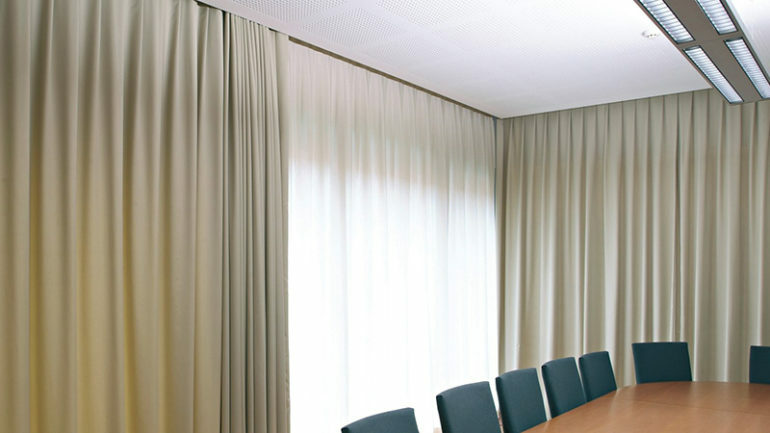 Fire retardant curtains from Corona Contracts are available for all commercial buildings and businesses. They’re suitable for use in public buildings, healthcare institutions, educational buildings and entertainment venues. Generally, if a business is open to the public and has fabric curtains there is a legal requirement for some level of fireproofing. If you manage hotels, hostels, shops with changing rooms, pubs, a hospital, school or theatre, we can design, build and install bespoke fire retardant curtain systems for you that look great and conform to all legal performance regulations. Of course, beyond meeting the legal requirement for fireproofing, you’ll also benefit from the peace of mind that should the unthinkable happen, the spread of fire will be to some extent prevented by the installation, protecting vital documents and other damage. The fireproof curtains we manufacture meet all UK regulations with regards to flame resistance. Specifically, our fireproof curtains conform to BS5867 Part 2, C regulations. This means that the materials used have been put through a rigorous testing process. The flame resistant fabrics used are washed repeatedly in high temperature machines before being exposed to a naked flame. This test makes certain that any flame retardant coating applied to the curtain material maintains its resistance and integrity both before and after multiple washes. The BS5867-2:2008 regulations for fire retardant curtains also ensure that, when exposed to a naked flame, the edges of the curtain remain intact and do not provide a surface for the flame to accelerate. Further checks for Part 2, C of the regulations require that no burning debris fall from the material to prevent it from assisting in the spread of the fire. Finally the fabric is checked for unsafe levels of heat retention after exposure to a naked flame finishes. The fire retardant curtain systems we offer to businesses are customisable to ensure that they fit as seamlessly as possible into the spaces they were designed for. Some types of materials suitable for fire retardant curtains are naturally resistant to flame sources, man made materials like polyester are a better foundation than natural materials such as cotton, which have less natural resistance. If you have a specific requirement for the appearance or material of your fire retardant curtain please get in touch to discuss your needs. Our in house team is able to offer a greater degree of customisation options than other firms who may outsource to a number of suppliers and manufacturers. We offer material, style and finish choices to suit everything from theatre and cinema curtains to fire resistant hospital curtains. Our fire retardant curtains can be combined with a range of our popular upgrade options. Our motorised curtain track systems are popular with theatres and cinemas and make a great match for our flame resistant stage curtains. These systems are available with automatic and remote control operation and always include manual operation as a backup in case of power failure. We can also add anti-ligature systems which are useful when designing fire retardant curtains for schools, nurseries and other ares requiring child-proof fixtures. All of our products are put together in house, so just let us know your sizing requirements and we will devise a fire retardant curtain to suit. We have many years experience creating, supplying and installing curtain systems for businesses including providing services to the NHS, so you can be sure your health and safety compliant curtains will be handled with the utmost professionalism. We pride ourselves on excellent quality products and industry leading aftercare and would be delighted to provide you with a system that meets your safety requirements. Contact us today to discuss your requirements. What specification are fire retardant curtains from Corona Contracts? Fire retardant curtains from Corona Contracts meet BS5867 regulations. More information on these regulations and the fire resistance they guarantee can be found here. Can Corona contracts add fire resistance to blinds? Yes. We can use fire resistant fabrics as part of both our curtains and our blinds systems. Get in touch to discuss your needs. Can Corona add fire resistance to my existing blinds / curtains? Unless Corona have manufactured your existing blinds or curtains, we cannot modify existing installations. We may, however, still be able to help. Reach out to our customer service team for a chat about your needs. Will my fire retardant curtains look different to regular curtains? Because Corona design and manufacture all products ourselves, we are able to create your fire retardant curtains to any specification you require. Let us know the look you would like to achieve and we will find a way to realise it. How long will my fire retardant curtains last? All products made by Corona Contracts are intended to last for many years of commercial use, our fire retardant curtains are no exception. Can blackout curtains or blinds be made with fire resistance? Yes, fabric blackout curtains and blinds from Corona can be made with fire resistance, contact us for more info.